While borrowing continues to reflect contact with other cultures, many scientific words are not strictly speaking loanwords. Rather, they are constructed from roots adopted from the classical languages. This has the advantage of a degree of semantic transparency: if you know that tele, graph and phone come from Greek roots meaning respectively 'afar', 'writing' and 'sound', and vision from a Latin root meaning 'see, look', you can begin to understand telegraph, telephone and television. You can also coin other words using similar patterns, and possibly elements from other sources, as in telebanking. ・ Kay, Christian and Kathryn Allan. English Historical Semantics. Edinburgh: Edinburgh UP, 2015. Whilst Greek had been recognized as a language of learning for centuries, it was not until the nineteenth century that large numbers of neologisms were formed from etymologically Greek words and elements. Indeed, Bailey (1996: 144 [= Bailey, R. W. Nineteenth-Century English. Ann Arbor: U of Michigan P, 1996]) points out that 70 per cent of the Greek words in the 80,000-word core vocabulary of English appeared after 1800. In no way is our language more wronged than by a weak readiness with which many of those who, having neither a hearty love nor a ready mastery of it, or lacking both, fly readily to the Latin tongue or to the Greek for help in naming a new thought or thing, or the partial concealment of an old one . . . By doing so they help to deface the characteristic traits of our mother tongue, and to mar and stunt its kindly growth (1872; 22, cited in Bailey, 1996: 141--2 [= Bailey, R. W. Nineteenth-Century English. Ann Arbor: U of Michigan P, 1996]). Others objected to the profusion of technical and scientific vocabulary, again mainly from Greek and Latin sources. R. Chenevix Trench wrote (1860: 57--8) that these were 'not, for the most part, except by an abuse of language, words at all, but signs: having been deliberately invented as the nomenclature and, so to speak, the algebraic notation of some special art or science'. ・ Baker, Peter S. Introduction to Old English. 3rd ed. Malden, MA: Wiley-Blackwell, 2012.
folcāgend, masc. possessor of the people. folccyning, masc. king of the people. folctoga, masc. leader of the people. herewīsa, masc. leader of an army. lēodfruma, masc. first of a people. lēodġebyrġea, masc. protector of a people. mondryhten, masc. lord of men. siġedryhten, masc. lord of victory. here- in combination with adverbs and prepositions. 871--89 Charter of Ælfred in Old Eng. Texts 452 þas gewriotu þe herbeufan awreotene stondað. 1646 Youths Behaviour (1663) 32 As hath been said here above. 'the compounds of there meaning that, and of here meaning this, have been for some time passing out of use, and are no longer found in elegant writings, or in any other than formulary pieces' (Todd's Johnson 1818, at Therewithall). 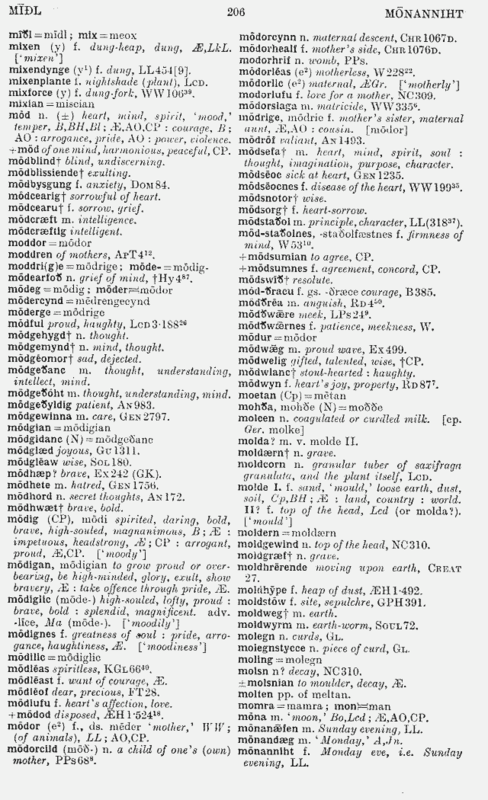 ・ mōdig "spirited, bold, high-minded, arrogant, stiff-necked"
・ mōdigian "to bear oneself proudly or exultantly; to be indignant, to rage"
・ mōdsefa "mind, thought, understanding"
・ mōdgeþanc "mind, thought, understanding"
・ mōdgeþoht "mind, thought, understanding"
・ mōdgehygd "mind, thought, understanding"
・ mōdgemynd "mind, thought, understanding"
・ mōdhord "mind, thought, understanding"
・ mōdlēast "want of courage"
・ swīþmōd "great of soul"
・ Hall, John Richard Clark, ed. A Concise Anglo-Saxon Dictionary. 2nd ed. New York: Macmillan, 1916.